Can you ever have enough open storage? 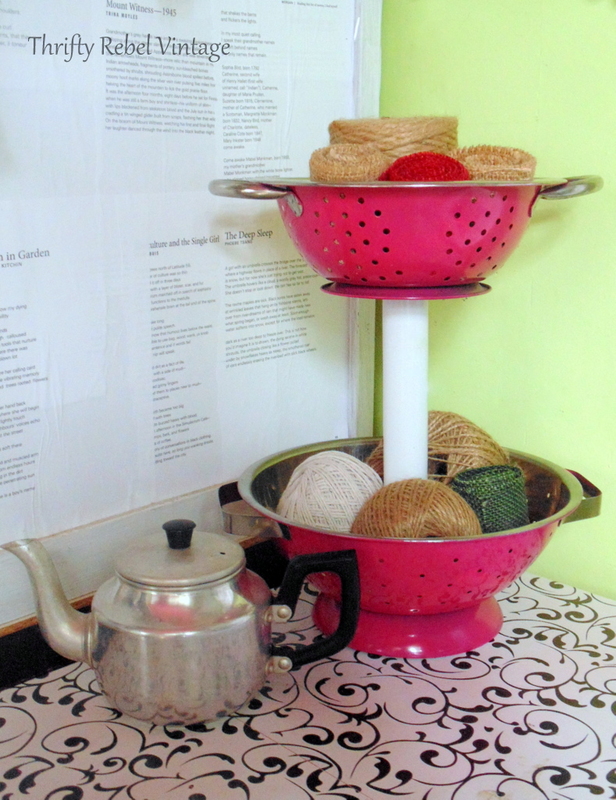 I know I certainly can’t, and a diy tiered stand is a great way to repurpose some inexpensive thrift store finds. For me tiered stands are one of the most useful storage solutions because they can be made out of so many different things, which means they can be used in so many different ways. 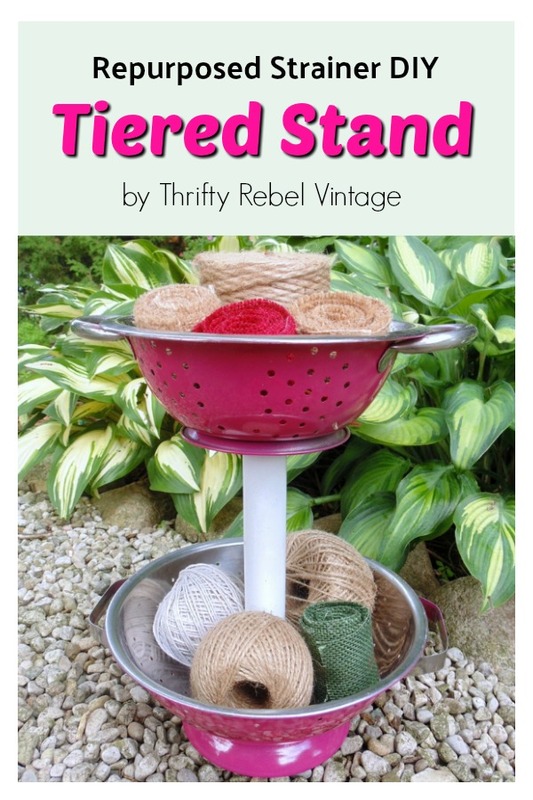 Today, I’m sharing how easy it is to create a diy tiered stand using just three thrift store items and a few simple tools. 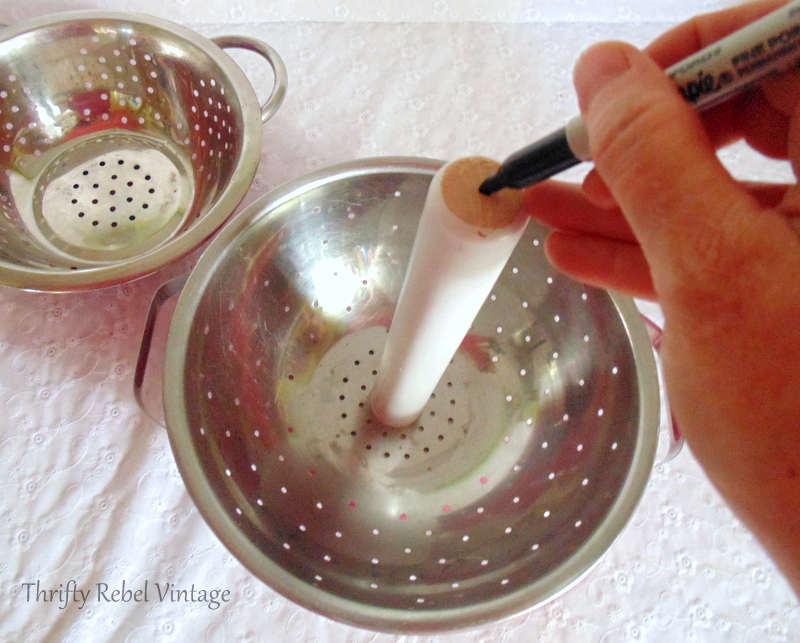 They are two 50 cent metal strainers, one a little smaller than the other, and a $1 wooden counter top paper towel holder. 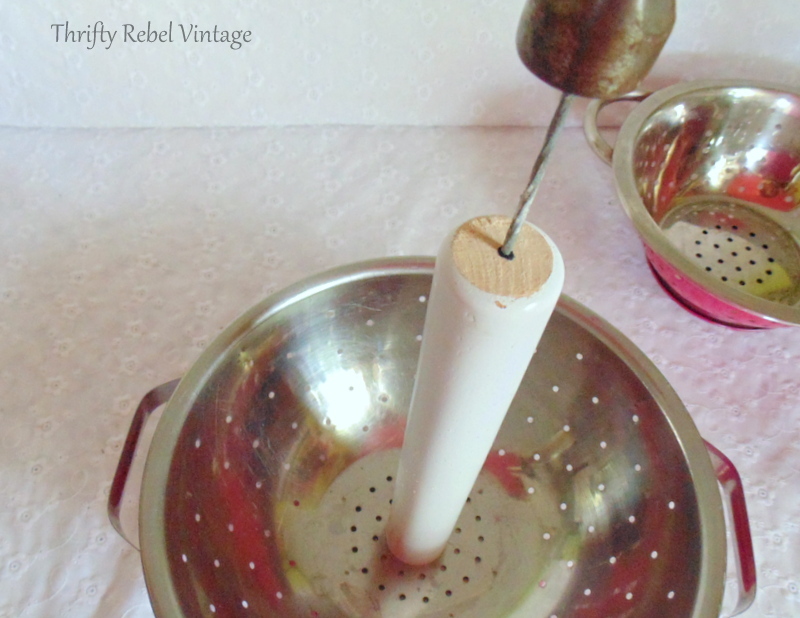 A paper towel holder like this is perfect for a diy tiered stand project because it unscrews from its base. Look for the complete list of tools needed for this project at the end of this post. 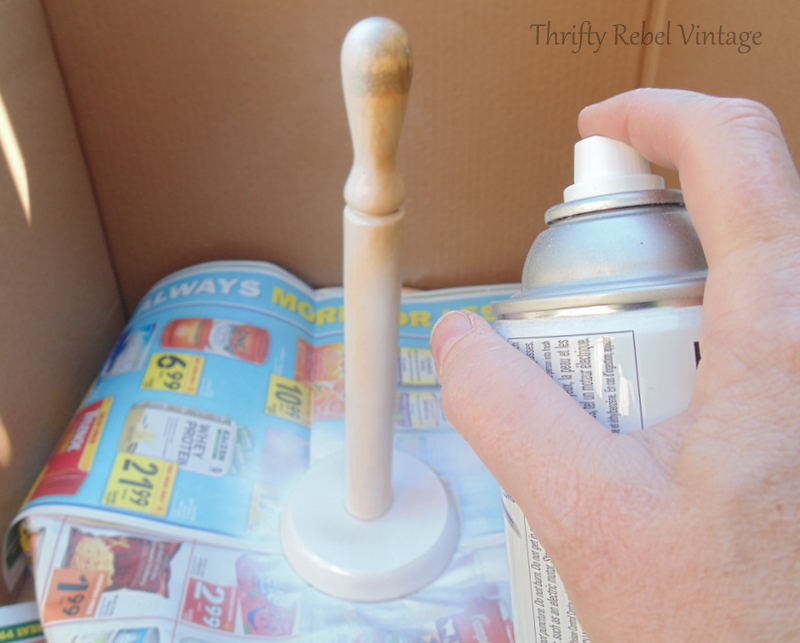 The first thing I did was spray paint the paper towel holder white. 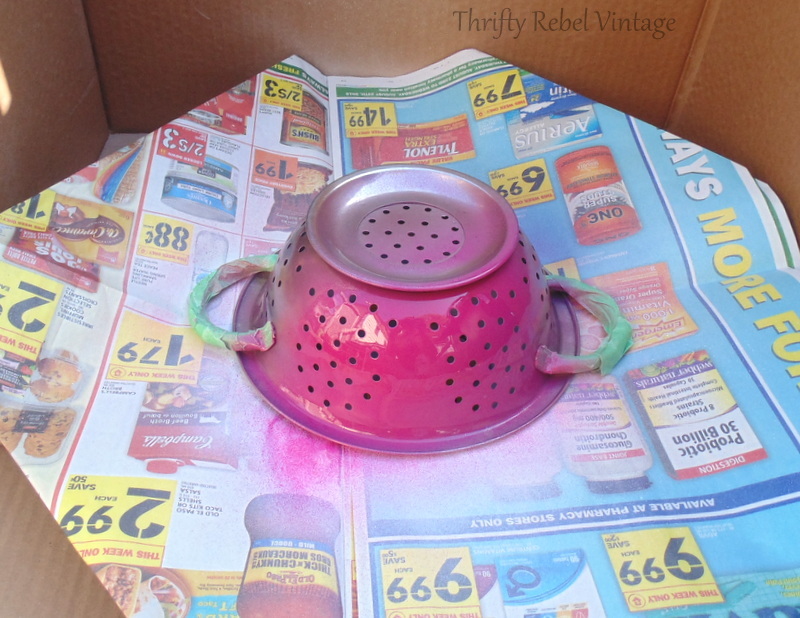 I taped off the handles of both strainers before spray painting. This is purely a personal choice, but I like the look when they’re left the silver. If you want to save a little time you could totally skip the tape. Then I sawed off the top knobby part of the paper towel holder. I’m not using it in this project so it’ll be saved in my stash. Sawing it off was so easy because the indentation was already there to follow with my mitre box and saw. 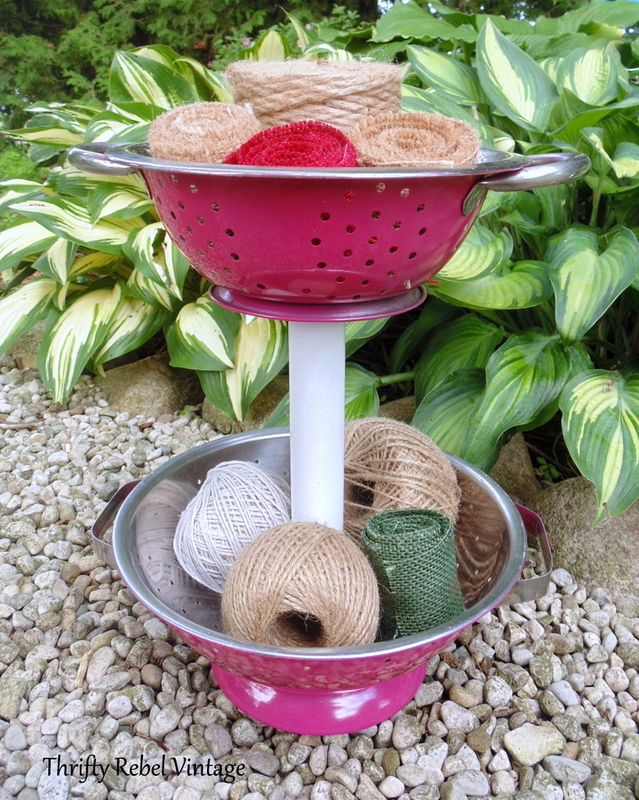 The great thing about using strainers for a diy tiered stand project is that they already have holes in them… so no drilling is required. Yay! You might have to enlarge the center hole though, so the screw that’s already in the paper towel holder will fit through. 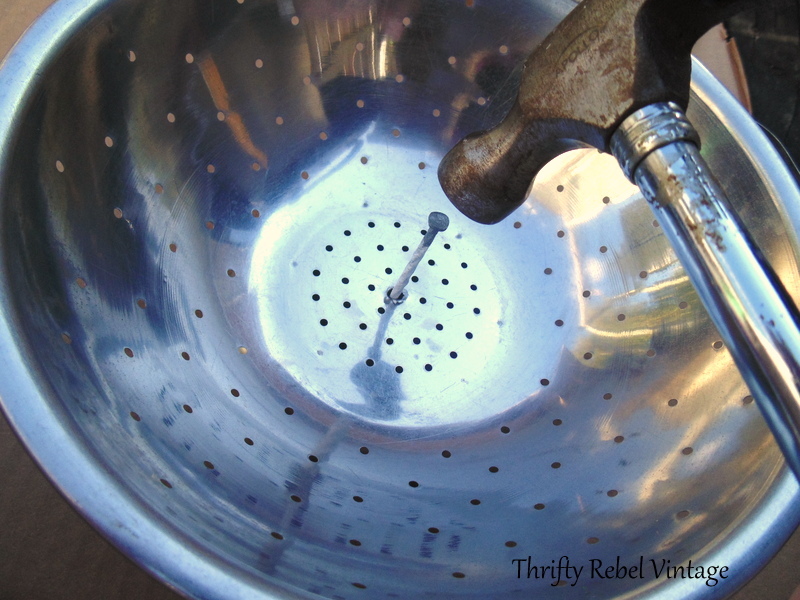 This is so easy to do with just a large nail and a hammer, provided your metal strainer isn’t too thick. It was at this point that the day got too hot and muggy so I had to move inside to get this project finished. The paper towel holder base fit right inside the bottom of my strainer. 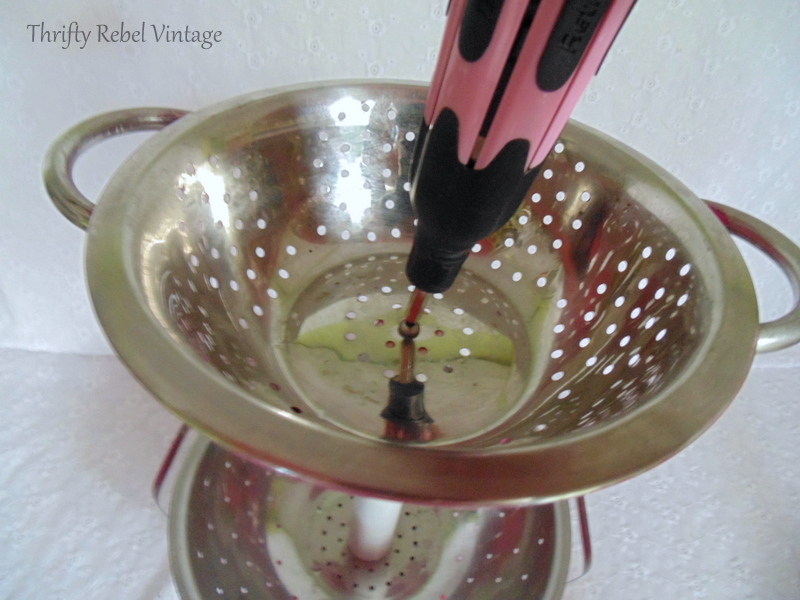 This is super important so you have no problem screwing the paper towel holder together through the bottom of the strainer. If the bottom doesn’t fit then the top part won’t reach the base to screw in properly. 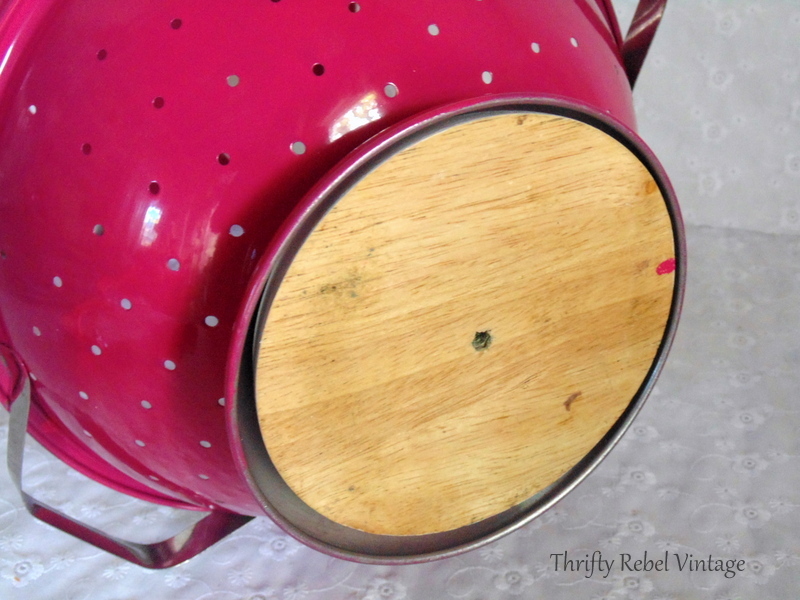 After screwing the paper towel holder through the strainer I marked the center at the top. And again I just used a good size nail and a hammer to make a start hole for a screw. And I screwed on the top strainer. I just used a lone screw that I found in my tool box among many other lone screws. Here’s a good look at the bottom strainer after it was put together. Thankfully the early evening was not quite as warm so I was able to go back outside to take some pics in the natural light. As you can see in this pic the screw in the top strainer almost disappears, and it allows for more room than if I had the knobby thing in the middle. 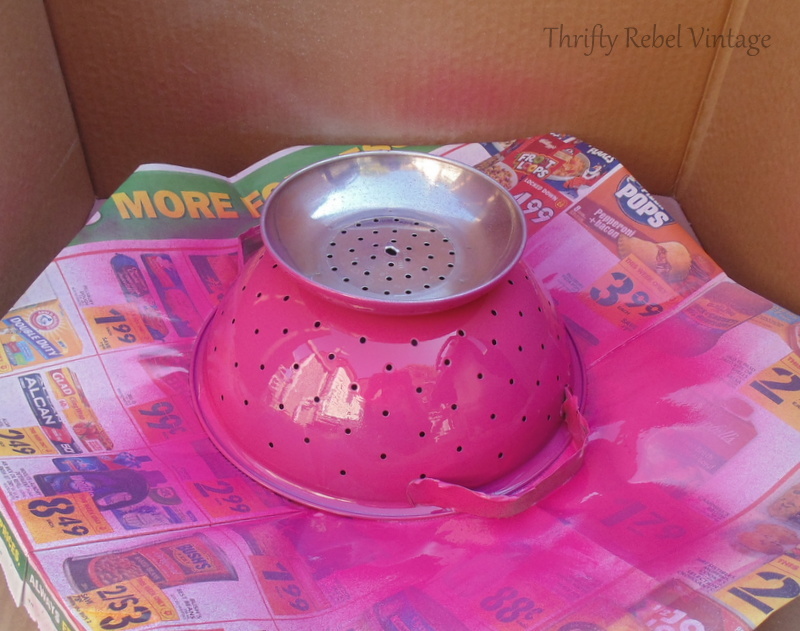 Of course you can spray paint your strainers any color you want. Silver metal goes beautifully with so many colors. But for me pink, any shade tone or hue, and silver are just meant to be together. What do you think? What color would you paint yours? To make it even easier you don’t have to spray paint anything at all. 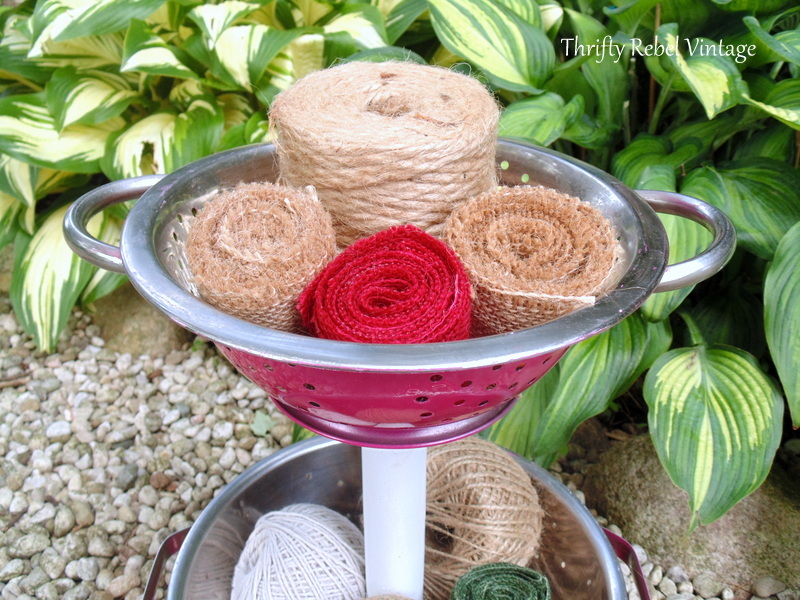 Just use what you find it its au natural state, and you’ll be done this diy tiered stand project in no time. As I said at the beginning of this post tiered stands can be made out of so many things, and today’s project is just one example. 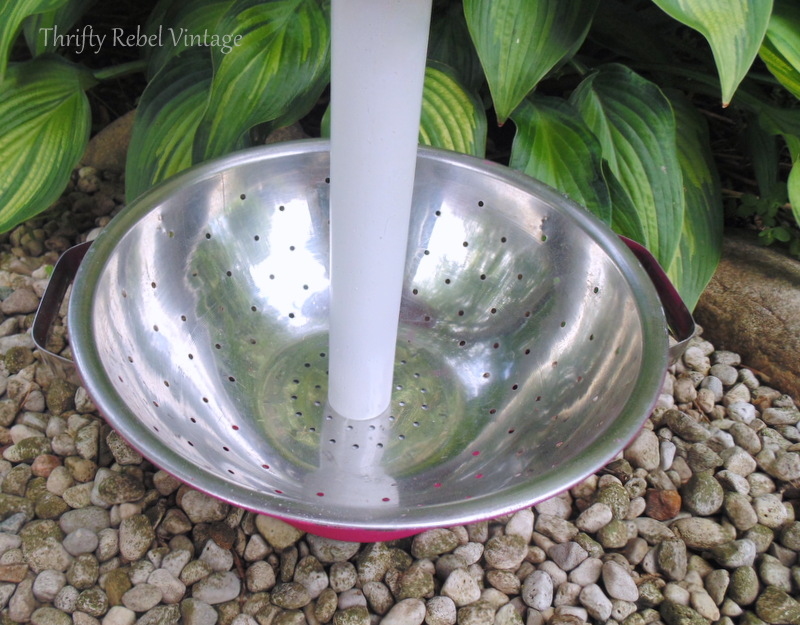 I’ve also made a bundt cake pan tiered stand, and a vintage enamel bowl tiered stand. So if you’ve never made one, give it a try! 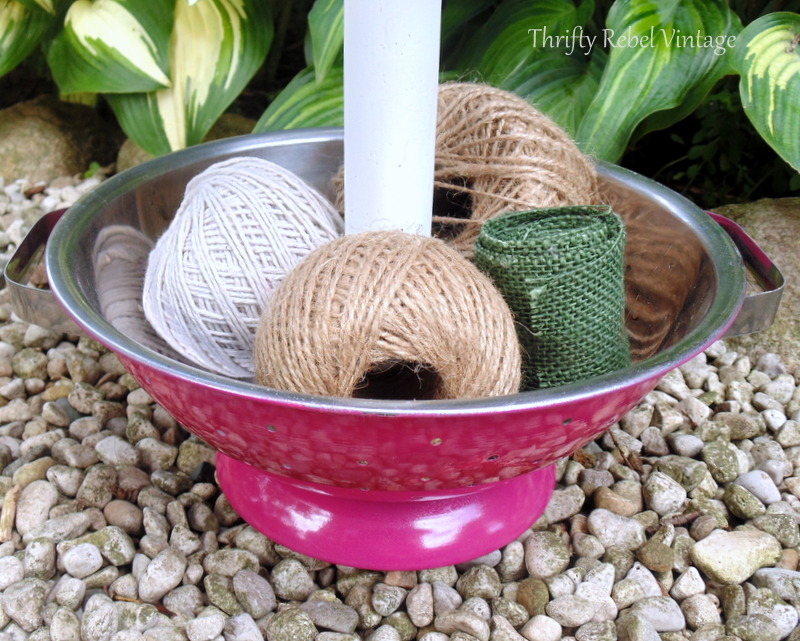 A diy tiered stand is a great way to store things that you use every day so you can see them. 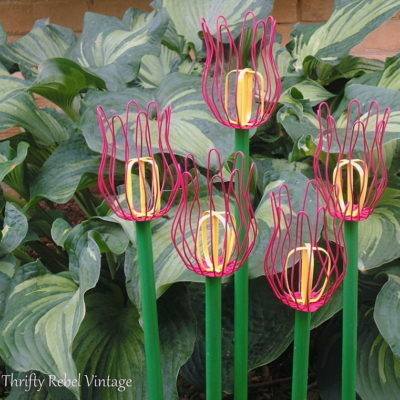 And it’s a fabulous way to repurpose some thrifted finds. Love this. 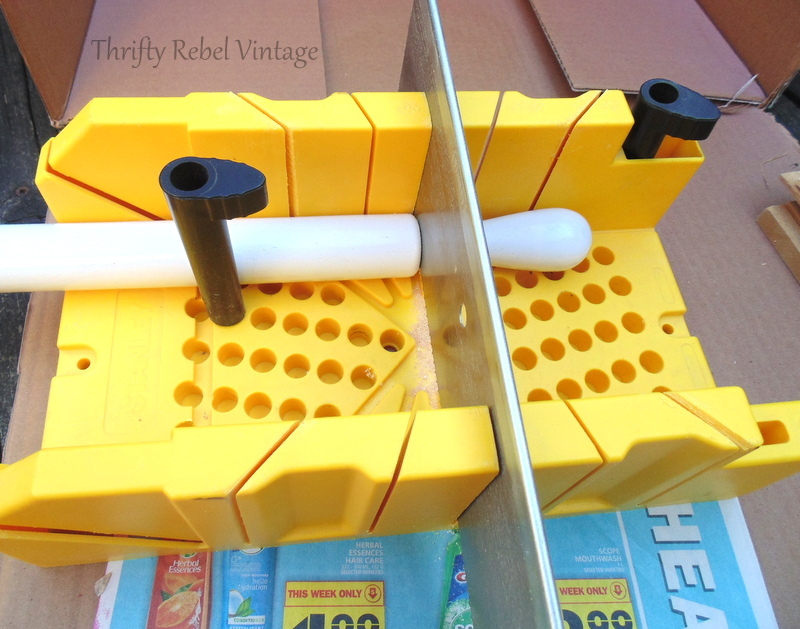 Great storage project for any number of things and would be great for planting succulents in as well and set outside on your picnic patio table. 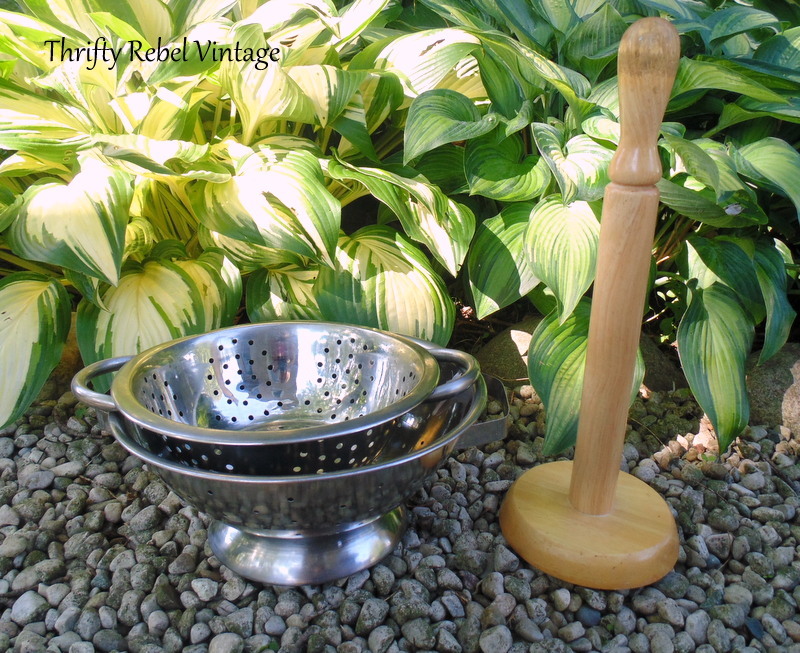 I have a rather larger metal strainer that I picked up for $2.00 at the thrift store just the other day. When I say Large strainer; this baby is 15 1/5 inches across and is 6 1/4 inches deep. 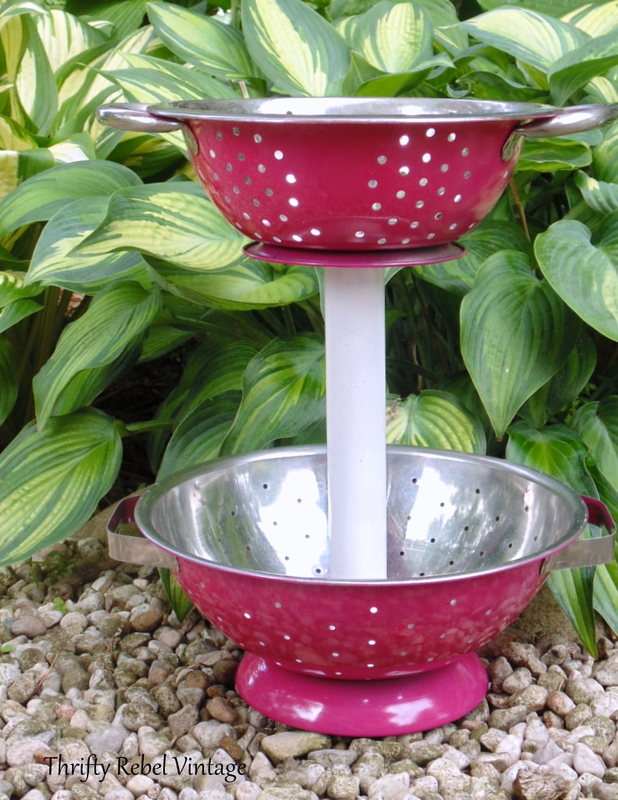 Clever, pretty, pink and functional! Thanks Dona! How did I know your choice would be purple? lol. Your mind must be working all the time…this is a great idea. I’m not very creative. It’s hard for me to envision how things will turn out. So thankful there are people like you to learn from…don’t stop!!! Very clever and I too love the pink and silver together. Of course I would paint mine aqua! 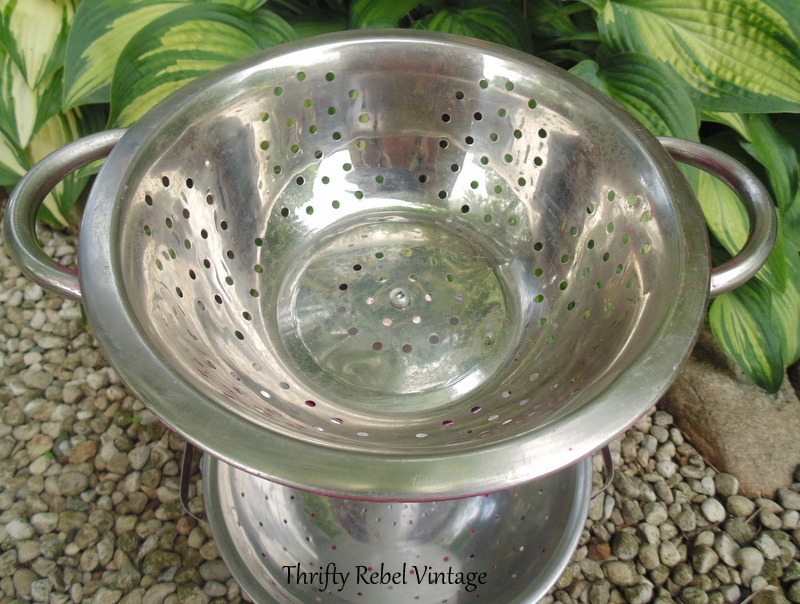 I have a weakness for old metal strainers. I have a big one that has feet. I think that would be perfect for the bottom one. It also has the star pattern. I’m going to have to look for one I don’t love. I couldn’t give up using that one. Great idea. I would leave it silver and display old fashion Christmas balls. Thanks for sharing. This is so cute and I can think of so many ways to use it. I could see fruit in it or even plants, craft items and on and on. Love it. This is a great project and I would use it to hold notions and bits of this and that just as you have. 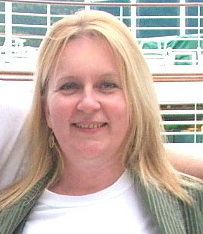 If you have a chance, it would be lovely if you shared your post with us at Creatively Crafty. 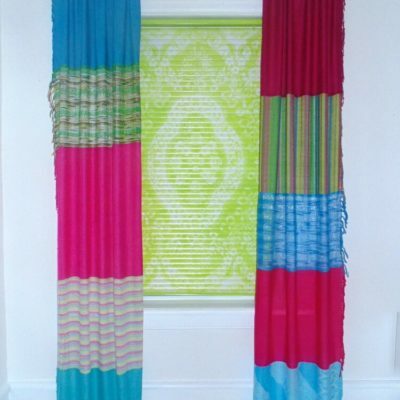 (https://lifebeyondthekitchen.com/creatively-crafty-link-party-135/) We love recycled/upcycled/repurposed crafts!